The business marketing app for iPhone and iPad – Marketissimo! Is your website delivering enough sales? Do you fully leverage SEO and Search Marketing? For whom is Marketissimo? The marketing app is designed for marketing & sales professionals, executives, Chief Marketing Officers, entrepreneurs, and small business owners. Marketissimo is like a personal “marketing coach” in your pocket - it guides you through critical questions to grow your business to the next level. 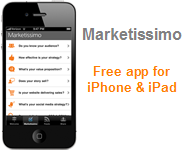 The Marketissimo app for iPhone & iPad is free and is available in the Apple App Store!